Our latest in-demand data in association with Parrot Analytics comes ahead of Cartoon Forum in Toulouse this week. Our data, covering the major European animation-producing territories of the UK, France and Ireland, reveals it is family entertainment that is whetting viewers’ appetites. The chart covers the top American- and European-produced cartoons over the September 4-10 period. Unsurprisingly, family favourite The Simpsons is first in the UK and second in France and Ireland, taking more than 1.1 million average daily demand expressions in the UK and 715,320 in France. 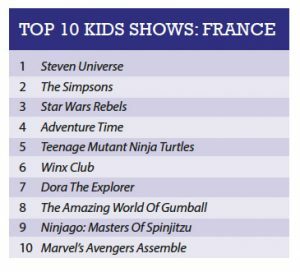 Another US toon, Cartoon Network’s Steven Universe, is top in France, while a newer show, Nickelodeon’s shouty series The Loud House, takes top spot in Ireland. Parrot notes that only The Simpsons, Steven Universe and Adventure Time appear in all three markets, and each charts shows notably different preferences among their young audiences. 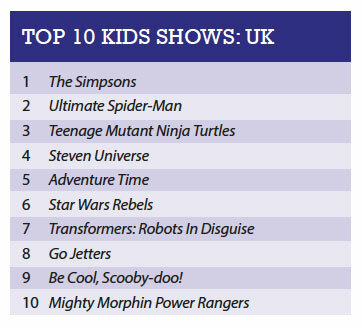 The UK shows a preference for action-adventure toons such as Ultimate Spider-Man (second, with 986,864 demands), Teenage Mutant Ninja Turtles (third, 775,144), Star Wars Rebels (sixth, 565,638), Transformers: Robots in Disguise (seventh, 552,723), Be Cool Scooby-Doo! (ninth, 514,270) and Mighty Morphin Power Rangers (tenth, 502,385). France also shares the taste for action-adventure, but also shows more interest in European productions such as Rainbow’s Winx Club (sixth, 290,232) and Danish-US coproduction Lego Ninjago: Masters of Spinjitzu (ninth, 240,697). Demand is Ireland is significantly more driven by preschool. 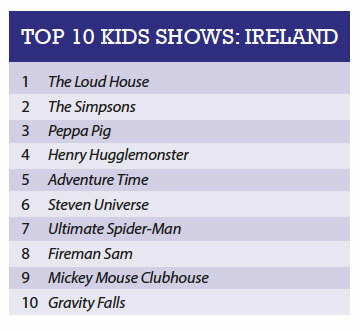 The Loud House, which has found audiences across the kids spectrum, leads the way, followed by Peppa Pig (third), Henry Hugglemonster (fourth), Fireman Sam (eighth) and Mickey Mouse Clubhouse (ninth). With the European business descending on Toulouse for Cartoon Forum on Wednesday for the annual pitching event the news provides food for thought. Cartoon Forum will feature programmes from a record 22 territories, with one series, Snowsnaps, being the first from Canada, which is known as a prolific provider of original kids TV. There will also be efforts from Poland, Croatia, Hungary, Macedonia, Latvia, Lithuania, Estonia and Bulgaria. France, as usual provides the most entries, with 26 projects, while the UK is second with nine and Ireland third with eight.